Alex Norwood is highly optimistic with the direction that the Storks find themselves moving in, but is well aware that they’re nowhere near the finished article. The first team coach, who aids management duo Liam Smith and Dixon Lambert, stated that it’s still very early days in the building process at the Ruby Civil Arena, but he’s confident that the club will soon starting seeing the fruits of their labour. The trio have followed the blueprints to a tee since succeeding Steve Wilkes at the start of last season, collectively shaping the future at Well Street, and Norwood is hopeful that results will eventually reflect their toil and vision. 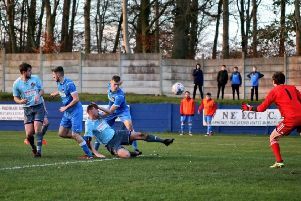 Padiham have impressed on the road against Litherland REMYCA and Irlam in recent weeks, and gave Hallmark Security Premier Division leaders City of Liverpool a run for their money at the weekend. However, the club only collected a point to show for their efforts. “They should take a lot of confidence from it,” said Norwood. “To produce that type of performance against the league leaders shows progress. “Ultimately we didn’t get anything from the game, it’s all about performances and points, but we’re heading in the right direction. We just need something to show for our efforts. “It’s going well and the next step is to start getting results consistently. We need to raise our game against every team, regardless of where they are in the table. That’s the challenge. “They need those levels of consistency because they have been complacent in the way they’ve approached certain games. Padiham have failed to register a win in their last four outings in all competitions but Norwood is backing the players to transform that record when they take on Burscough at Victoria Park tomorrow. The corresponding fixture culminated in a 3-2 defeat at the back end of September but the Storks have come on leaps and bounds since then. “There’s been a big turnover of players,” Norwood said. “We’ve had to be patient but now we’ve started to get the squad together that we wanted. “We’ve got the group of players that we’d earmarked when we came in to the club. We’ve had some short term fixes in that time, which is never ideal, and we’re still one or two players short, but no manager will tell you that they’re 100% happy. “If we can translate our recent form in to games like Burscough then we’ll be there or thereabouts. We were horrendous last time we played them. “We were just awful but hopefully we can improve on that. If we continue playing as we have been then the results will come and hopefully that will start on Saturday. “We’ve put a lot of time in to this and now we’ve got a brilliant group of lads. “That makes the job easier. But, ultimately, we want results. 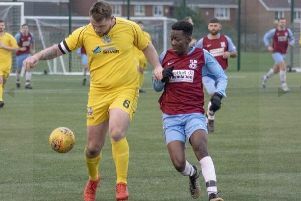 Burnley United lost ground at the top of the Storefirst East Lancashire League First Division on Saturday as they were held at home by Feniscowles and Pleasington. The Blackburn side claimed a 3-3 draw at Barden, but on an off-day for Paul Fildes’ men, will have come away disappointed at not taking all three points. United are now seven points behind leaders Mill Hill – who have a 100% record – with a game in hand. Tomorrow sees the fourth round of the Bluefin Sports Insurance LFA Amateur Cup, as United travel to face Anchorsholme. The reserves won 3-1 at Oswaldtwistle St Mary’s in a hard- fought game and lost 4-3 at home to title favourites Rishton United on Wednesday night. United’s reserves are at Langho Reserves tomorrow. In the Lancashire Amateur League, Burnley Belvedere also shared six goals at home to Blackrod Town. Kez Carroll netted twice, and Nathan Lawless added a penalty. Belvedere’s second string built on their first win of the season with a 1-1 draw at Whinney Hill. The reserves are at Barnoldswick Town tomorrow. Crown FC and Red Lion progressed through to the quarter finals stages of the Pendle Charity League Cup following victories against North Valley Rangers and Nelson Dressers respectively. Andy Husband, Peter Archer, Tony Hartley and Brad Parker were all on target as Crown beat Valley 4-3. Martyn Hathaway, Chirs Yates and Josh Westwell replied for the visitors. Danny Conway scored four goals as Red Lion beat Nelson Dressers 7-3 to progress into the last 8 in the competition. Charlie Morris added a brace and David Brogan also struck for Lion. Dressers’ goals came from Nathan Hawke, Jake Stead and Craig Ford. In Group B, Sacred Heart also booked their place in the last eight of the competition after recovering from a two-goal half-time deficit to draw 2-2 against Pendle Blues Athletic. A superb Connor Eastwood finish and a well-executed lob by Matt Room gave Athletic the advantage, but second half goals from Alex Cawtherley and Damian Williams secured a point to take Hearts through. They will be joined by either Paak United or Prairie Athletic who meet this coming Sunday. A hat-trick from Daz Carruthers and goals from Dave Preston and Alex Grice ensured that Britannia FC finish top of Group C following a 5-0 win against AFC Veterans. They will be joined by Pendle FC in the quarter-final stages who beat Pendle Blues 7-3 thanks to braces from Tom Swindells, Paul Holden and Lee Jackson. Jonny Thompson and Craig Harrison were also on the score sheet for Pendle. Barnoldswick Barons secured a place in the quarter finals following a narrow 3-2 win against AFC Blacko in Group D.
Sabden gave themselves an excellent chance of qualifying from the group as they beat Pendle FC Blacks. David Fallon and Paul Astin both struck twice for Sabden. Pendle Blacks replied with goals from Ben Lee and Morgan Stansfield.